Progress, preparation and dedication, these are the key elements necessary to succeed. As it happens, these are also defining characteristics of “REAL LIFE” whether you know him solely as an artist or as a friend and family member. So strong are these traits that when I was offered the opportunity to be a part of the creation of the newest and most vibrant addition to the long line of releases available from the man himself, I literally jumped at the chance, for it is not every day you get the chance to be a part of history and that is most certainly what was about to occur. “Tank” who most will know as the talented and soulful beat maker who has worked alongside REAL LIFE on “Hip Hop Don’t Stop” and the monumental release that was the “What Happened? EP” from across the ocean thus far. “ROCK” who is not only a very talented photographer and true REAL LIFE fan, but a close friend and companion, whose dedication to REAL LIFE on both a musical and spiritual level has to be seen to be believed. We made our way to the “breathtakingly beautiful” secluded recording facility that was carefully selected for the task at hand, and prepared to create our very own slice of Hip Hop history. Upon our arrival, it was clear that we were in the midst of our very own Eden, full of awe inspiring sights, saturated in a pitch perfect silence. There are no better surroundings for anyone looking for the undeniable link between man and nature, and I assure you of that. And so it began, the pieces of the puzzle laid out in front of us, and nothing but time, space and focus for company. With the inspirational and talented proprietor and engineer “Nick Turner” at the boards, we were focused, and “The Bigger Picture” was under way. We open the album with the funk filled “I’m All About” where REAL LIFE details a crystal clear walkthrough on how to live life like REAL LIFE. Delivering a manifesto of positivity and clarity designed to uplift and motivate, which it accomplishes with ease. Next up “The Lady Track” where our host displays a poignant and genuine view towards the female of the species, explaining throughout the track that women are to be cherished and respected, and the track is made even sweeter with the inclusion of the soul shattering vocal talents of Glasgow’s very own “Becca Starr”. On to the next track, which in my personal opinion is destined for radio play – “Mindin’ my Biz”. A toe tapping, knee jerking classic that is sure to be lodged in your brain for years to come, which is soaked in positive energy and the trademark swagger found only in REAL LIFE lyrics. Also featured on this album, is the long awaited continuation of the ongoing Hip Hop drama “REAL and Self Part 3”. In this tale of booty chasing shenanigans we are led on another misadventure courtesy of “Self” and his derriere obsessed counterpart “REAL”. With the added extra of the legendary talents of the turntable technician “DJ Zeeny” supplying intricate and entertaining razor sharp cuts. This is sure to be a fan favourite. The following track, is one that is really close to my heart. It is the title track of this album, and understandably as it is EASILY the most passionate and moving performance I have ever had the pleasure of being witness too. 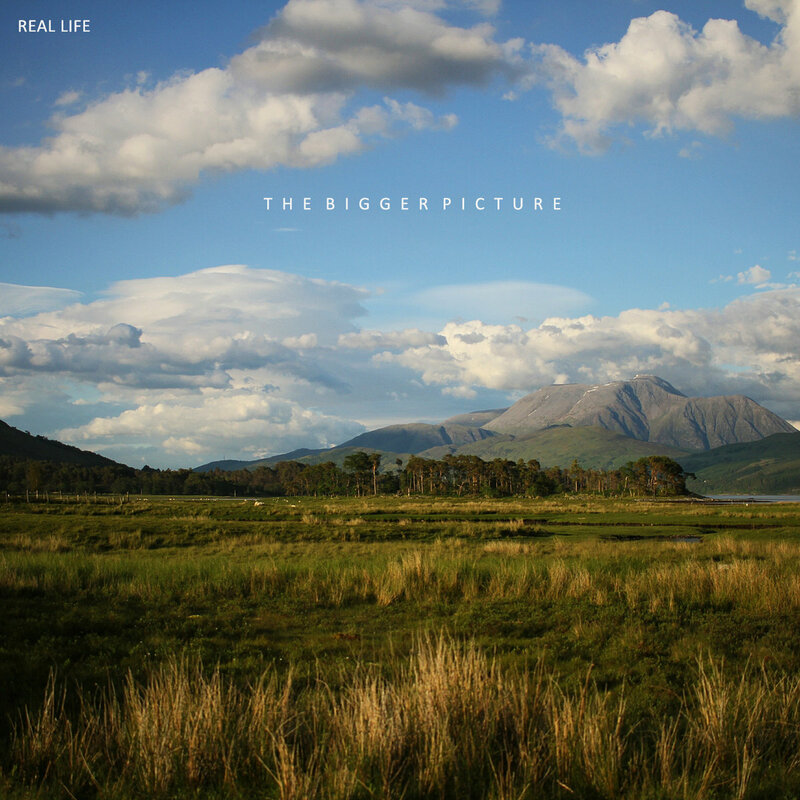 “The Bigger Picture” is when REAL LIFE gets really real, undeniably opening his heart and bleeding onto the beautiful instrumental which in short, was fated for its purpose. Actually being there in the room as this track was being recorded for the very first time was the most emotional experience I’ve had in my time in music to date. This track will break your heart and lift your soul, all at once. “Stand Tall” is next in line, and in this track REAL takes the opportunity to summon a fire from deep within himself to deliver a message to not only the people from his homeland, but all around the world! Highlighting various concerns he has centring on the overzealous attitudes displayed by the so called protectors of the innocent and empowering those who may feeling outnumbered. A truly inspiring concept, guaranteed to rejuvenate the spirit. Never one to forget those who are supporting him and providing inspiration, “Thankful” is REAL LIFE showing gratitude the only way he knows how, through candid lyricism directed at each and every person who has supported him throughout his journey. Also featuring on this track are the hypnotic vocal tones of the very talented “Connor Reeves” which sets off the tracks intent perfectly. “You Gotta Know” serves off a chunk of unstoppable bravado with REAL exhibiting unrelenting confidence, married perfectly with a bouncy and boisterous beat saturated in signature Tank fanfares and smooth bass licks. A delight for any fans of true hip hop designed to uplift and engage a crowd. As the dust settles and the final instrumental rings out, “Fin” is a display of technical genius on the part of Tank. It’s smooth and hypnotic vibe is the perfect closer for the roller coaster ride that is this album. things SHOULD be, positive and energising. “To live in hearts we leave behind is not to die.” – Thomas Campbell.